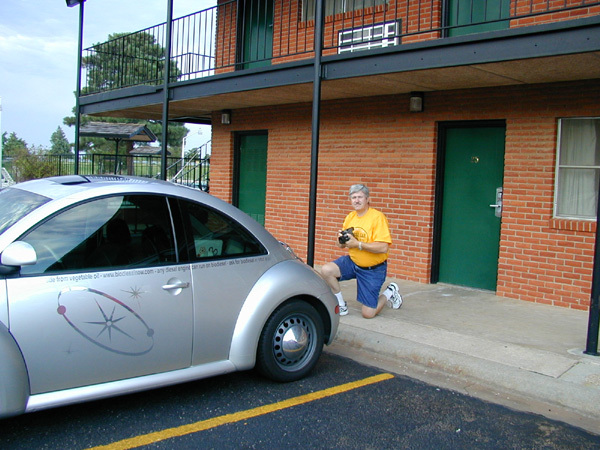 June 17, 2004 - "chamber of commerce photographs spacepod"
On behalf of the Sweetwater Chamber of Commerce let me say how much I enjoyed meeting you and spending some time with you. I got a lot of great pictures. Sweetwater loved hosting you again this year! We hope you'll pleasure us with your company again next year. The caravan got a lot of play in the local newspaper (Sweetwater Reporter) -- a full week's worth in every edition. Everyone who came out to visit Thursday evening and Friday morning were excited about the event, and those who missed out were very disappointed. Hope you enjoyed the space candy and the Sweet Water. Please keep in touch in preparation for 2005!